Most audiences are used to seeing Singh as an over-the-top goofball, so his role in Young & Fabulous is something of a departure. In the comedy-drama film, Singh plays Mr. Boo, the discipline master at Solaris College. 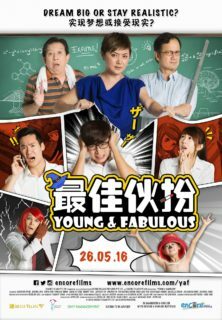 The central trio of characters, Royston (Aloysius Pang), Hao Ren (Joshua Tan) and Violet (Joyce Chu) are his charges and the recipients of his disapproval. The film is set in the Singaporean cosplay scene and touches on the themes of chasing one’s dreams in the face of a society that prizes practicality over creativity. Singh spoke to F*** at Raffles Convention Centre ahead of the film’s premiere that night. It turns out that in real life, Singh is a far cry from the manic persona he is most associated with. Sure, he definitely still has a sense of humour, but he’s clearly a very separate person from Phua Chu Kang. He spoke about the role that parents and teachers play in a child’s development, his own encouragement of his children’s creative endeavours and how the entertainment industry has evolved over time. What is it like getting into character to play a strict discipline master? I think it’s actually easier to get into the serious side of things because in real life, I’m quiet, so it wasn’t too much of a stretch or a challenge to play the role. I think it will be more challenging for viewers to watch me this way because people are used to me being larger-than-life, funny and comedic all the time, and this is not like that. It has its funny moments, but I’m not being funny. You have said in interviews that you would support your children’s pursuit of their passion. Do you also feel it’s important that they get good grades and earn university degrees? I think if they are good at studies, then by all means, go ahead. I’m not saying, “stop studying”. I’m just saying that many times, parents try to relive their failed dreams through their children, and I think that’s very sad. I am a walking testimony of how I didn’t get a degree, I wasn’t smart enough to go to NUS (National University of Singapore) – twice I tried and my A-Levels [results] weren’t good enough. Anybody in my position would have said, “okay, I’m stuck with A-Levels now and my future doesn’t look good, I’m going to be stuck with a certain level of job and a certain level of pay.” But as it turned out, it wasn’t like that at all. I’ve always told my children that as long as it’s legal and they’re happy, it’s fine. But as parents, we have to guide them. They might think, “this is good!” but we have to tell them, “here are the consequences and here are the challenges going forward” because we know better than them. Then if you still want to go with it, by all means, go with it. I have parents who come to me and say, “my child wants to be a superstar, he wants to be a celebrity”. That’s fine! If he can dance or sing or act, then that’s fine. But the child also has to know that it’s a lot of hard work. A lot of children out there who are not guided think they can just come in, sit in front of the camera, sing, dance, act, host, done! Tomorrow I’m a celebrity. It’s not like that at all! Sometimes it happens overnight, sometimes it takes more than that, sometimes you don’t get the show that really is that vehicle to take you to that fame status and the child has to be guided and told about such things. Whether it’s for the entertainment industry or whether it’s to become a doctor or a lawyer or a fireman, as a parent, you have to say, “if this is what you really want, let’s research about this, let’s see what this career path entails.” Then you draw up all the challenges and put it in front of the child and say, “do you still want this?” If they say yes, go for it then. If your daughter says she wants to be an actress or a host, you’d be in favour of that? It’s fine! I’ll be a hypocrite if I said, “no, you cannot be [an actress]! It’s not very good.” When my elder daughter was about eight years old, she said, “Dad, when I grow up, I want to be a celebrity.” I said, “oh, that’s…cool?” And she said, “I want to be a different kind of celebrity. The kind that nobody knows about. I have the money, I have a lot of projects, but nobody takes photos with me and I’m free to do whatever I want.” That was eight years old, let her dream. In Singaporean society today, what do you feel the balance is between the role a parent plays in the development of a child and the role a teacher plays? I’ve always been a strong advocate of how parents are the main people in terms of guidance for the child. The teachers are coming in in terms of education and academics. But in real life, social skills and all that, I think the parents have bigger roles. I’m sad to say in the past few years, I’ve seen more of that being transferred to the teacher, instead of the parents taking what is supposedly theirs. Now, I feel that we are in a new phase. I’m a council member in the Families For Life council. We sit down every three months, talk about, plan and execute events and strategies where we hope more and more families get together. Not just the mother and the child, but even the father, so that they can grow stronger together in terms of the bonding time. For the longest time, I know it’s a cliché, “spending quality time” has been around. That phrase “quality time” has been used as an excuse. “I’ll spend two minutes with you, that’s so ‘quality’. And now, I’m going away to play golf for the next three hours.” That’s screwed up for me. I think it should be the other way around, you play golf for two minutes and spend three hours with your child. As a council member, we are allowing more and more platforms for the family to get together and have that time together. It’s one thing to have quality time, but you must have “quantity time” as well. The more time you spend with your child, the more opportunities you have to exercise your responsibility in their lives. Did you have any pre-conceived notions about the hobby of cosplay before taking on this film? Not at all. For me, it’s just another version of a Halloween party. At the bottom-line, that’s what it is. I have no ill feelings towards kids who cosplay. I didn’t find anything new because I’m already a collector of comics, I’m a Superman fan. I’m into comics, I’m into all this stuff, so it wasn’t a huge revelation of, “what is this? I haven’t seen this before!” Not at all. I’ve read all but two issues of my Superman comics collection. I first bought them in 1994 to 1996, and then I had chicken pox, so I started reading through every one. Recently, I picked up two copies. What preparation did you do to take on this role? I think nobody has to research it because everyone has grown up with a discipline master in their school. It was easy to draw on past experiences – I’m not saying that I was a bad kid in school, but I had a discipline master in primary and secondary school and they were all very fierce! They had this sour face, it was like they hadn’t had enough food to eat and somebody kicked them in the face every morning when they got up. Very grouchy and moody, and even the best jokes don’t make them laugh, so it wasn’t difficult to get into that role, I just thought back to it. What message did you want to convey through your character? It’s a positive message, isn’t it? Through my character, I actually show everybody that not everything is as it seems. When you see a discipline master in school, you’d think one way, “a discipline master is heartless, he probably has no family, even if he had a family he’s probably chased them away because he’s so grouchy.” This film addresses that. Maybe not everybody is like that, if you take the time and effort to get to know someone, you’ll find out that there are other facets to the person. For example, whenever people see me, they think that I’m a comedian, I’m always larger than life, in your face, “don’t pray pray” and all that – but when they sit down and talk to me or have dinner with me, they realise there are other facets of Gurmit Singh that we didn’t know about, and I think that’s what the movie does as well. What is the most important factor when you pick your projects? That it’s got some message, good values, and that it’s a role that I want to play. If this is a movie that is just glorifying some…evil, bad, vulgar concepts, I’m not interested in that. For me, it’s about the whole concept and it’s about the role that I’m playing, whether it’s going to be something that I enjoy playing. If it’s not something you enjoy, if it’s passé, it will show on screen. Pillar? No lah, please lah, hello! It’s too much man! I was more like a corner tile at the side there. Having been a part of the Singapore entertainment industry for some time, how do you feel it has evolved and developed over time? I would think that now, the entertainment scene is really flourishing because there are so many platforms out there. In the past, it was very hard to get known, to be heard, to be seen, to be even slightly noticed, because you had to know somebody in the industry to even get your foot in the door. But now, with the social media platform, anybody can be a producer, a writer, a singer, an actor, a host, whatever! Put it out there and you never know, depending on the number of hits on your site, you could be the next big thing. I think that’s great. But it’s also a double-edged sword, because on one hand, it allows the person who could not have been found through the old traditional means to now have that instant success and accessibility – but it also means that those who really don’t have the talent are just irritating everybody. It’s good entertainment for a while, but they’re also deluded. They think that just because they’re out there, that because they’re in the media, it means they’re very good. But it’s not, isn’t it? It all comes down to whether or not you’re talented. 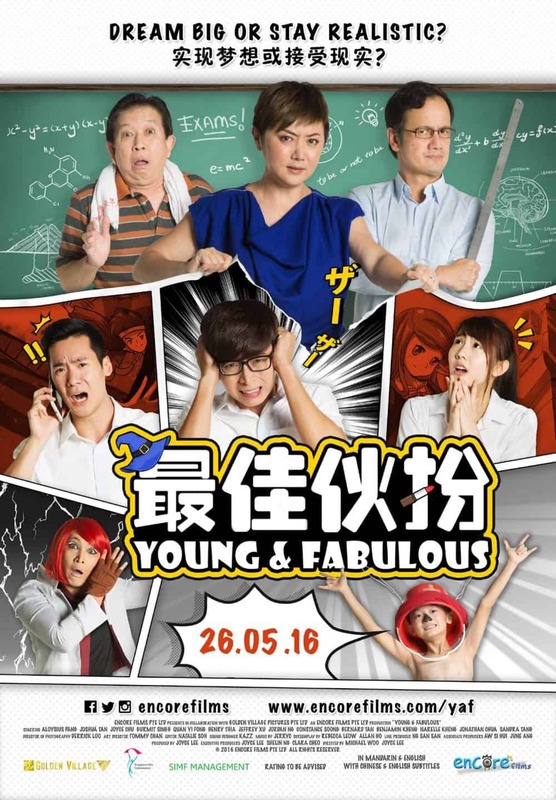 Young & Fabulous opens in Singapore on 26 May 2016.